The year is 2025 and like most of your neighbors, your house is not connected to the electric grid. During the summer, it is almost completely powered by the solar panels on your roof, which look like traditional roofing shingles but better. Solar panels generate 30% more electricity per square foot than ten years ago, and you have an energy efficient house and appliances. The 150 kWh battery in your electric vehicle alone could power your house for over a week. You have a home battery system in your garage that, along with your electric vehicle, absorbs solar electricity during the day to be dispatched whenever it’s needed. When the batteries are full, excess electricity is sold to neighbors and delivered by a battery drone or underground cables. The direct transactions are recorded over a neighborhood blockchain application. Sometimes, in the middle of the night, your car drives itself to a local charging station because it knows there is excess wind energy on the grid and it has negotiated a low price to recharge, which in turn charges your home battery system. The electric grid is dominated by wind and solar and is balanced mostly by price-sensitive autonomous electric vehicles. Your home energy system knows your energy requirements, it can send your car to get more, and it monitors the weather forecast to predict your self-generation and the availability of cheap wind energy. Excess solar generation in the summer is used to melt sodium acetate phase-change material, which is converted back to a solid on-demand in the winter, releasing stored latent heat for both water and space heating. As customers started going off-grid, electric utilities had to raise rates on existing customers, making the financial case even better for disconnecting. Electric utilities that were slow to offer off-grid services and electric vehicle charging have gone bankrupt and many have been taken over by municipal and non-profit utilities. Nearly all energy generation is local, keeping money in communities. The new energy and transportation economies have provided more jobs and economic opportunity than any other industry in the last 15 years. The monthly payment for your off-grid system AND electric vehicle is cheaper than grid-supplied electricity and gas. The payment for your solar roof, electric vehicle, and batteries is far lower than an electric bill, gas vehicle + fuel, and conventional roof. 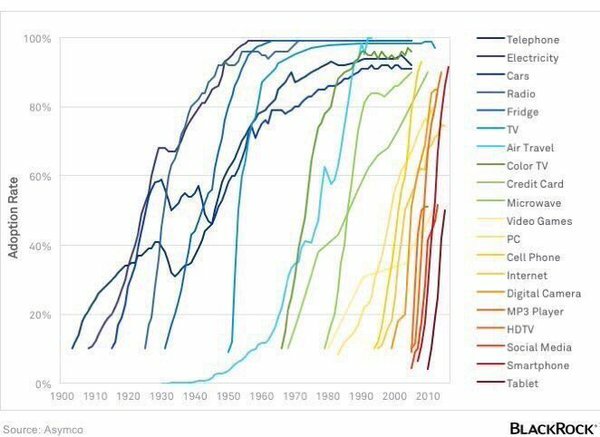 The connected world has made adoption of new technologies almost completely vertical after the tipping point is hit.